Pavia is a lovely town located in northern Italy in the region of Lombardy. Where is Pavia? How to get there? If you ever happen to be in Milan and have a spare day to discover a new place you should definitely consider Pavia. 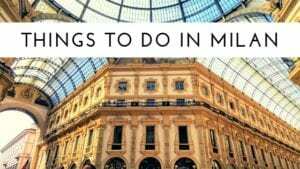 It is very easy to get there from Milan as there are frequent trains available, you can also go by car if you prefer and it should take around 40 to 50 min depending on the traffic. The history of Pavia is very rich and interesting as it was once the most powerful city in the north. Today it remains an important and active town mostly known for being a renowned college town with the ancient University of Pavia in the center of it. The Certosa di Pavia is a beautiful monastery situated just outside of Pavia. When I first saw it I was struck by its beauty and by the history, art and architecture which can all be found in this magical place. I was obviously very curious to discover the history behind this masterpiece and started to read all the information I could find about it. The first stone of the Certosa di Pavia was placed in 1396 by Gian Galeazzo Visconti but it would take another two centuries to complete the project. When it comes to the style, the Certosa di Pavia represents a mixture of Gothic, Renaissance and Baroque styles and there is a chance you are going to fall in love with this place even if you are not an avid art fan. Another interesting aspect of this place is the fact that some monks actually still live there taking care of guided tours and surrounding areas. I could write pages about this amazing place and probably still wouldn’t do it enough justice. All I can say is go and visit if you have a chance! The Castello Visconteo is another beautiful place in Pavia definitely worth visiting. The Castle which was built in 1360 was square with four towers and a long moat filled with water from the near Navigli. There were more than 500 people working day and night on the construction of this amazing place. In fact, they were so hard-working and efficient that after only 5 years from the beginning of the works the Castello was ready for the Duke to move in. Some parts of the castle are still the ones built back in 1360 (windows for example) while others had to be replaced. The left tower of the Visconteo Castle is called “della Biblioteca” because that’s where Francesco Petrarca worked on some of his famous poetry while the right tower is called “delle Reliquie” – the remains of the saints were preserved there. During the battle of Pavia in 1525, the two rear towers and also the two sides of the castle were destroyed and subsequently rebuilt in 1600 and in 1700. During the 150 years that the castle was inhabited by the Visconti and the Sforza, it was visited by all the major Italian and foreign Lords who enjoyed hunting in a large and beautiful park nearby. 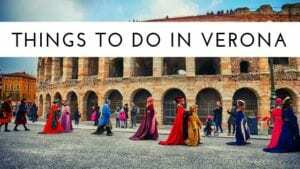 If you ever happen to visit Pavia you will certainly come across another beautiful sight of this town and I am talking about The Ponte Coperto, known also as Ponte Vecchio. The Ponte Coperto di Pavia is a bridge over the Ticino River and it had to be rebuilt after the 1944 bombing. The current bridge, like its predecessor, is humpbacked and it has one hundred granite columns supporting the roof. It is, however, bigger and taller compared to the medieval version. In 2005 on the 50th anniversary of the death of Albert Einstein in the central part of the bridge was placed a plaque with these words: “Die schöne Brücke in Pavia habe ich oft gedacht” (“I have often thought of that beautiful bridge of Pavia”). This inscription was referring to a sentence wrote by Einstein in a letter to an Italian friend in 1947 in which he was writing about his time spent in Pavia. The ancient University of Pavia is a must-see while visiting the town. It was founded in 1361 and is one of the most important Italian universities. The university offers a wide variety of disciplinary and interdisciplinary teaching grouped in 18 Departments and has study programmes at all levels: Bachelor’s degrees, single-cycle Masters degrees, research degrees, specialty schools and level I and II Masters degrees. The Basilica of San Michele Maggiore is an amazing church built between the 11th and 12th centuries and is considered one of the most important landmarks of Pavia. The Basilica is in an ochre color which comes from the use of this kind of sandstones. The facade is characterized by four half-pillars which divide the surface into three parts, each having its own ribbed portal. There are also nine windows on the facade (of which one cross-shaped) which allow the passage of light inside the building and especially in the main aisle of it. The Basilica of San Michele Maggiore represents a Latin cross plan. Behind the altar, there is the Majesty, an impressive complex made of gilded wood dating from the seventeenth century. Photo credits: all images inside this article can be used by linking to this page following the Creative Commons Attribution-ShareAlike 4.0 International License.